The "golden years" of unbridled west coast logging were not without consequence. Until the mid 1990’s no protection was afforded to stream ecosystems. As a result, vast amounts of vital freshwater salmonid habitat was destroyed. For British Columbia’s timber industry, the forests of Vancouver Island were too rich to resist: giant spruce, Douglas-fir and red cedar trees fetched top dollar on the open market. 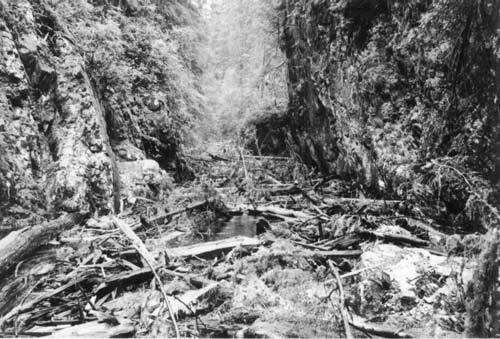 On the Island’s remote Pacific coast, mechanized logging kicked into high gear in the 1950's and continued through the decades that followed. "...it makes you a little melancholy to think that these cold green depths will shortly be reduced to ruin by monsters of machinery. The towering logger with the movie-star face, who stands beside us on the flat car admits a pang of remorse at the prospect of denuding this green valley, but what can you do about it? No logging, no work for loggers." 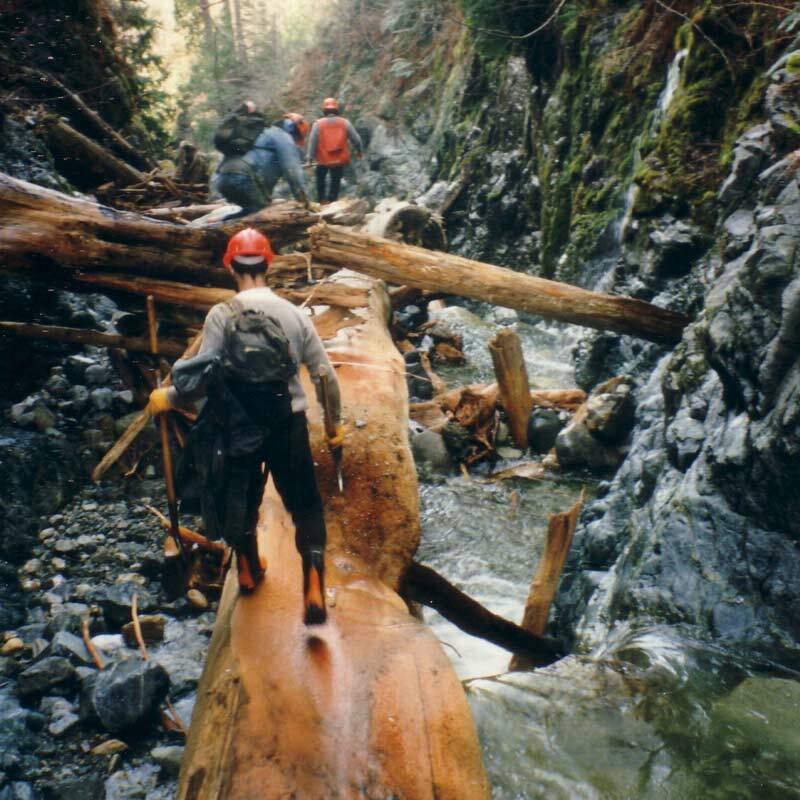 Modern day Vancouver Island owes much of its early development to the logging industry; Island timber has been commercially harvested since the 1820’s. The seemingly endless supply of ancient trees and the incredible value they could command in the open market, combined with the proximity to the ocean for transport, earned Vancouver Island the reputation of a “Logger's Eden”. In the 1950’s, mechanized logging replaced traditional methods and the forestry companies were now able to level vast stretches of forest at an unprecedented rate. This unbridled development was not without consequence; up until the mid 1990’s no protection was afforded to stream ecosystems, as a result significant amounts of vital salmonid habitat and was degraded or destroyed. 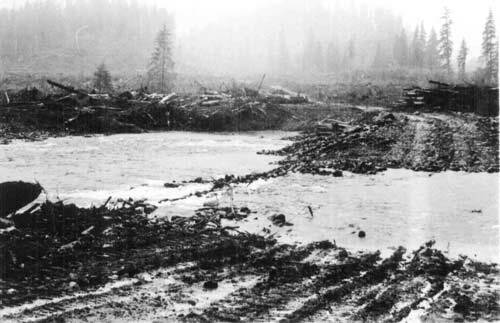 For over a century, logging companies were not obligated to mitigate damages to salmon bearing streams and we are now living with a legacy of these practices today. Across Vancouver Island, there are vast stretches of dark, tightly spaced, single-species forests where diverse old-growth once stood. Many creeks and rivers are clogged with waste wood from logging operations that used them as dump sites, preventing fish from accessing upstream spawning grounds. Predictably, the removal of trees from the steep and saturated valley walls of our coastal watersheds resulted in devastating landslides; burying the rivers below in rock and debris. In other cases, streams were mined of their spawning gravel to be used for road construction or the creeks themselves were simply used as roads. The only thing more integral to the fabric of coastal B.C. than the ancient forests is the Pacific salmon. Vancouver Island is home to once legendary runs of Chinook, coho, chum, sockeye, pink and steelhead. These coastal rivers and streams are a critical part of the salmon life cycle, and the loss of freshwater spawning and nursery habitat is a major threat to the survival wild salmon populations. Decades of over-fishing, habitat destruction and poor management has resulted in significant declines in wild salmon populations. 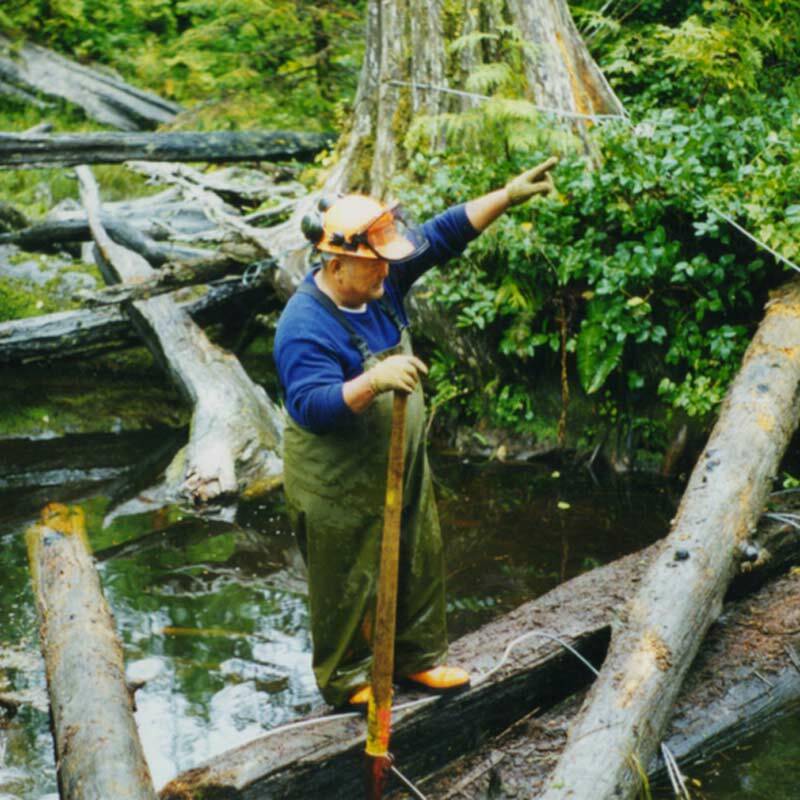 The Central Westcoast Forest Society (CWFS) was founded in 1995 by loggers, First Nations, biologists and forestry professionals who recognized the need to address the loss of habitat in order to preserve our wild fish stocks. 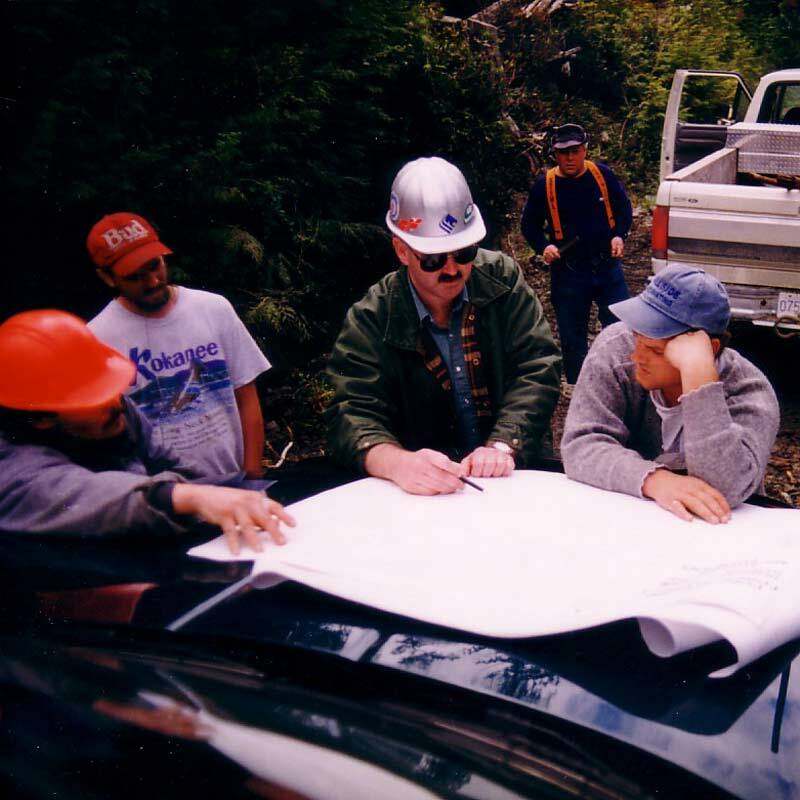 In the early 1990's growing public awareness and concern for old-growth forests encouraged the government of British Columbia to institute unprecedented changes to land-use policies. 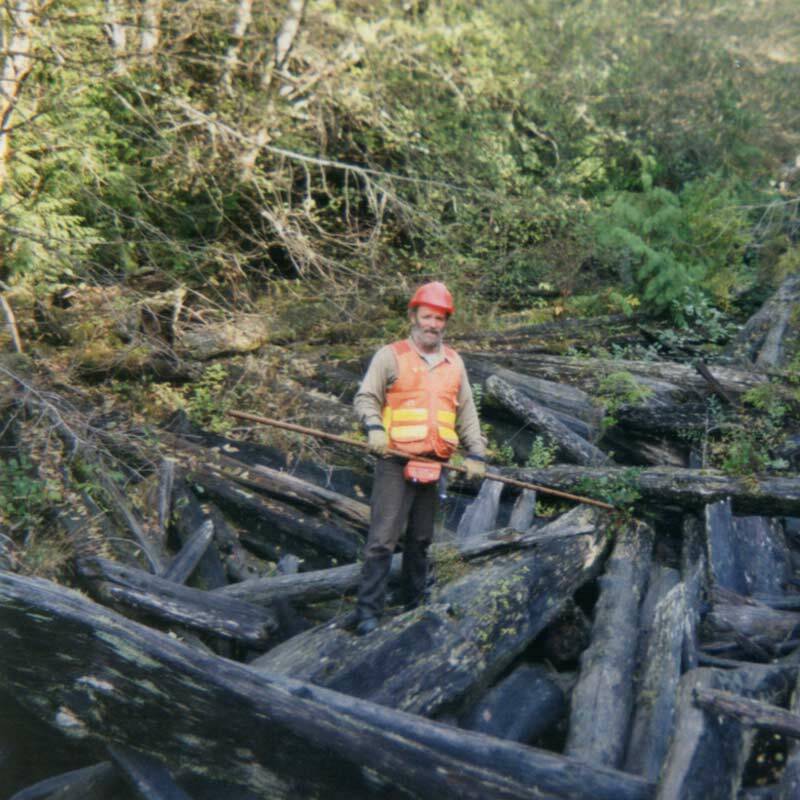 The new policies drastically affected forestry in Clayoquot Sound, and brought new focus to forestry practices and their impact on the environment. Although many environmental organizations focus on changing industry practices, few work with local and regional communities to fix problems created by past practices and to find solutions to move into the future, the Central Westcoast Forest Society was created in 1995 to fill this vacuum. Conceived as an apolitical organization, CWFS is dedicated to action based projects designed to directly improve local salmonid habitat post-industry. CWFS works to promote sustainable development that truly incorporates social, economic, and environmental values, recognizing the importance of connecting people to the place they live and the resources around them. The goal of restoration is not to return the watershed to a pre-altered state, but to help speed up the system's natural recovery, good restoration design understands that there is an immense variety of factors governing any given ecosystem. Central Westcoast Forest Society uses a holistic approach that recognizes the connection between ecosystems and the well-being of people. This method ensures that essential natural services and the systems supporting them are correctly valued, protected, and managed for the future by integrating the needs of society with scientific knowledge of ecological relationships. The purposes of the Society are: the protection, conservation, and enhancement of the natural environment through the restoration of aquatic and forest ecosystems, education, employment and stewardship. CWFS works closely with the 5 Nuu-chah-nulth Nations in our region: Ahousaht, Hesquiaht, Toquaht, Tla-o-qui-aht and Yuułuʔiłʔatḥ. The Nations provide direction and invaluable traditional ecological knowledge. These partnerships help leverage funding and create training, employment and capacity building opportunities. For remote communities, it is an opportunity to work in their own territory and to help rebuild one of the most culturally significant resources on the coast: wild salmon. "Its the greatest feeling...I would see my grand children when I get off the boat (after work) and they'd ask me what I had been doing? and I told them, I'm out there fixing up the creeks so that you can have fish when you grow up." In addition to local First Nations communities CWFS also conducts projects in partnerships with both the districts of Tofino and Ucluelet as well as Pacific Rim National Park Reserve; knowing that strong, long term, community relationships are paramount to successful restoration. By building relationships with community members and implementing local outreach activities, the society raises awareness and promotes stewardship. Education is a critical component to restoration; our community education programs include: films, interpretive walks, educational workshops, job skills training and support for sustainable community initiatives and other non-profits. The degradation and destruction of rivers ad forests, although extensive , is not irreversible, there are measures that can be taken to improve habitat conditions and bring back wild salmon stocks. For over 20 years CWFS has been working to help accelerate the recovery of these damaged ecosystems. Changes don't happen over night but there is hope for these watersheds. We can improve health of our local watersheds, in turn, improving the health and strength of our communities. Central Westcoast Forest Society is set to launch a new film in June 2015! The film is entitled Bringing Back the Light and speaks to the methods, the practices and the importance of forest habitat restoration in British Columbia. Wyatt Visuals and Burke Electric Media beautifully illustrate the work Central Westcoast Forest Society does and value wildlife habitat restoration. Funding for this film was provided by the Sitka Foundation. Please help us by sharing the film on your social network. Thank you! Central Westcoast Forest Society is excited to announce the release of a beautiful and insightful film that highlights stream ecology and the restoration work we are involved in on the west coast of Vancouver Island. We hope that you will help us by sharing the link with your network on Facebook, Twitter, or on your website or blog. This film was written and produced by Drew Burke of Burke Electric Media (drewburke@hotmail.com) and filmed and edited by Mark Wyatt of Wyatt Visuals. Partial funding support for this film was provided by the District of Tofino. In 2013 Central Westcoast Forest Society worked with Uu-a-thluk and Ahousaht Fisheries to begin the restoration of the Atleo River near Ahousaht, BC. Wyatt Visuals and Burke Electric Media (Drew Burke of Language Tofino) joined us to film the crew as they spent a typical day in the bush. The film gives an insightful look at what restoration means to people that depend on salmon. Funding for the project is provided by the Ahousaht-Mainstream Salmon Enhancement Subcommittee and the Training and Education Committee as administered by Mainstream Canada. Mainstream Canada and the Ahousaht Nation have a Protocol Agreement in place that provides funding towards salmon stream restoration within the Ahousaht Ha-houlthee. This program is managed through the Ahousaht Fish Farm, and specifically the Salmon Enhancement Subcommittee. Jessica Hutchinson specializes in ecological restoration and riparian areas management. She has worked in the environmental field for 14 years conducting wildlife habitat assessments, terrestrial ecosystem inventories, fisheries habitat assessments, and watershed level restoration plans. She is currently the Executive Director for Central Westcoast Forest Society and Ecologist/Owner of Coastal Rainforest Services and President of Strawberry Isle Marine Research. Jessica has a Master’s of Science from Royal Roads University in Environment and Management. Mandala was raised in Bamfield, BC on the west coast of Vancouver Island, where she spent her childhood exploring the outdoors and gaining a great appreciation for the plants, animals, interactions and processes that make a healthy and diverse ecosystem. After completing a Bachelors of Science in Environmental Science from Royal Roads University she worked in a variety of managerial and educational roles. Most recently she worked as an Environmental Monitor for a large-scale hydroelectric project in Pemberton and on local infrastructure projects based in Vancouver, BC. Mandala is currently the director of operations with CWFS, managing a number of ecological restoration projects. 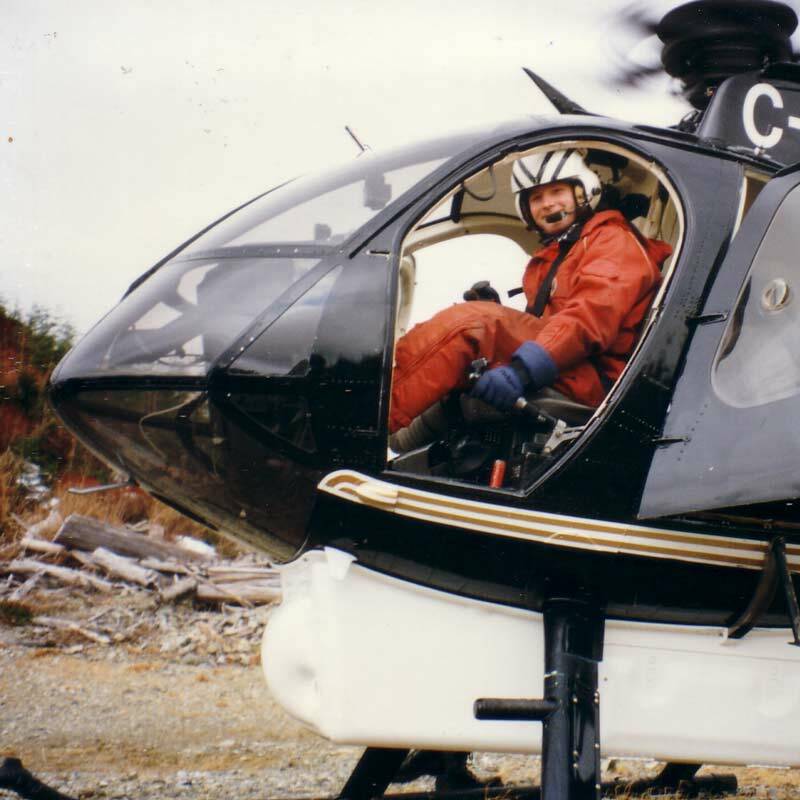 Tom began his career working in mineral exploration. He spent seven years as a project manager and junior geologist on grassroots exploration programs. During this time he worked extensively throughout B.C.,Yukon, N.W.T, Nunavut, and the Western Sahara desert. Joining CWFS in 2014, Tom has shifted his focus to the design and implementation of habitat restoration projects on the west coast. He earned his bachelors of science from the University of Victoria. Megan has a Bachelor of Science from the University of Victoria in Geography and Environmental Sustainability. Since acquiring her degree, she has been focusing her efforts on conservation on the coast of British Columbia. Megan has seven years of experience working for non-profit organizations facilitating citizen science programs, developing educational programs and restoring wildlife habitat. Currently, Megan is working as an project manager and volunteer coordinator for CWFS. Stephenie was born in Tofino BC and her family originates from the Hesquiaht & Ahousaht First Nations. Stephenie started volunteering and has been actively working for CWFS for 4 years as a field and environmental technician and volunteer coordinator. She is passionate about working outdoors & has many other jobs including working for her nation as council, tourism as an eco-friendly & cultural zip-line guide, and a First Nations Fisheries technician and dock monitor. Keya was born in Tofino, BC and grew up in Ucluelet. Fresh out of high school, she started volunteering for CWFS and quickly discovered a passion for the work they do. She has been working with CWFS since 2015, focusing on juvenile salmonids in Lost Shoe Creek, Tranquil Creek, and other watersheds in the area. In 2018, Keya took on the role of Environmental Monitor for the Highway 4 Kennedy Hill construction project. Learning about the work hands-on in the field has been valuable and one day she will further her education in university. Central Westcoast Forest Society is governed by a board of directors representing diverse interests.